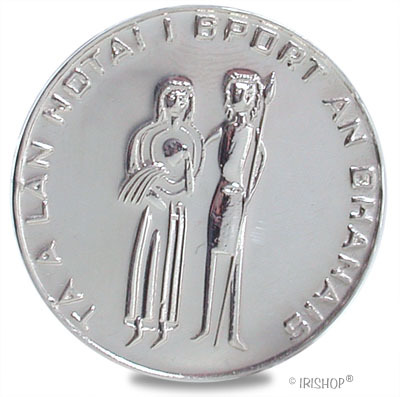 Solid Sterling Silver Irish Wedding Coin. Comes in a presentation box. The custom of the Groom presenting his Bride with a coin is said to date back to the time when the Groom paid luck money to the family of the Bride, in order to bring happiness and blessings upon them. After the exchange of wedding rings, the coin would be presented to the Bride as a symbol of worldy goods, (with this gold and silver etc..). There is a contemporary custom where the Bride and Groom exchange coins, and it is said that, if the coins clink as they are exchanged, the couple will be blessed with children. After the wedding the gift is often preserverd as a family heirloom, and is passed from mother to eldest son on his wedding day.